My wife is a workaholic. She always schedules more than a reasonable person can accomplish. So one idle science-fictiony thought caught in her brain and she mentioned it over and over for years — the idea of a room where you could go inside and time outside would stop. It’s a place where you could catch a nap and go back to the world ready to tackle your tasks. Canton, Missouri, a little college town on the side of the Mississippi River seemed the right place for this story. Now I needed a copper room. Now, there really are copper rooms. It’s a metal cage where outside electrical influences are kept out. I’ve seen them in laboratories where delicate instruments are calibrated. But this time I wanted a full-sized room where Jereomy’s inventor uncle built his room with an adjustable time rate. The name ‘Jereomy’ is the result of my habit of collecting names. Dozens of people I meet, clerks, restaurant waitresses, and people I meet randomly, especially those with name-tags, get asked about their name. I ask what the name means, how it’s spelled, and what ethnicity it came from. I keep a note of interesting names and occasionally one of these appears in my stories. Jereomy and his girlfriend Lil get caught up in the room, jumping through the future with no way to get back to their own time. It was an interesting problem. Where do you stop? Civilizations rise and fall and nobody can predict what will happen in the future. Do you accept the current status, with all it’s faults, or close the door and jump another hundred years into the future and hope it’s better. I had a lot of fun, taking one simple location, Canton on the river and seeing it progress through collapse and rebuilding. I also had the opportunity to toy with genetic modification problems. Might we have genetic-Chernobyl’s, where the area is contaminated with chemicals that trigger gene shifting where animals could leech code from one species to another? And what might the result of that be to the human race? As is often the case, I ‘invent’ a gadget and give it limits. Then it’s up to my characters to solve the problem it creates. Jereomy and Lil had a particularly tough time of it, and I’m proud of the way they handled it. 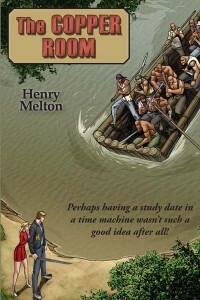 So, with one-way time travel and a new future of the human race, The Cooper Room is my favorite.